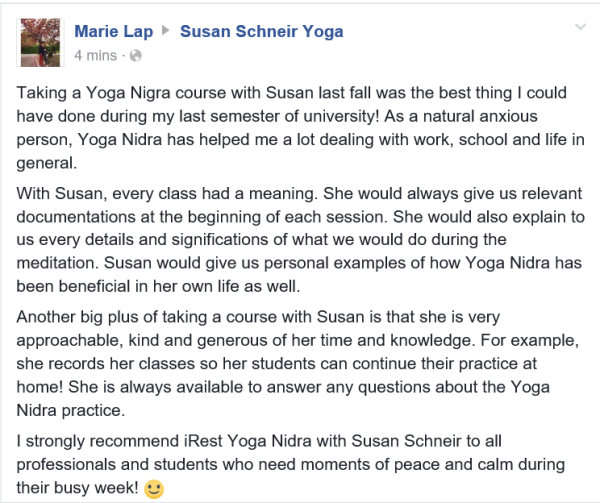 Yoga Nidra with Susan gave me a great sense of peace. It does stir up emotions but in the end, it offers a moment of respite where you can be yourself and move toward greater serenity. 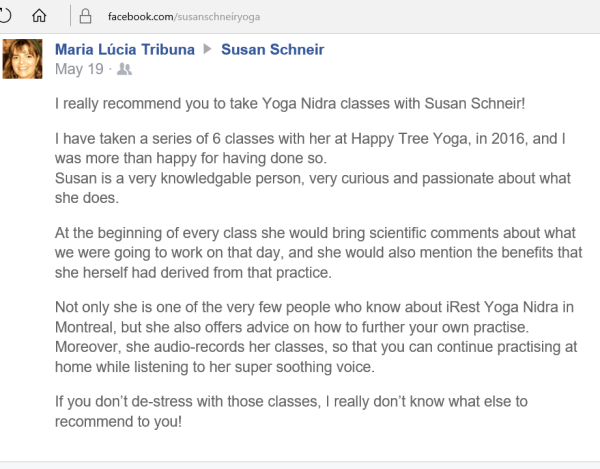 Le Yoga Nidra avec Susan m’a apporté un grand sentiment de paix. On brasse les émotions mais en bout de ligne, on s’offre un moment de répit où on peut être soi-même et cheminer vers une plus grande sérénité. Never before have I experienced the deep level of relaxation that I have in Susan's classes. She has an innate understanding of how to guide us to completely let go. Often the calmness is with me for days. Truly miraculous. 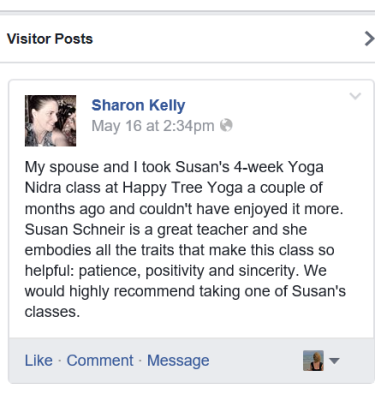 Yoga nidra added the elements of clarity and serenity to my overall yoga practice. Dealing with the stress of multitasking iRest provided a weekly reset to my system. I came out of classes with clarity of mind that lasted through the week. 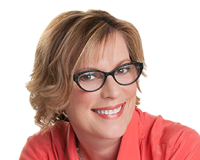 Susan's calming voice and attitude really helped me get a restful night of sleep. iRest gave me a deep and profound relaxation experience. I practice Yoga and meditation on a regular basis, but the iRest experience was different. I did not fall asleep one single time and I wouldn't say I was close. But I was not exactly awake either. It reminded me of my first and only hypnosis. I was very well aware of what was going on around me, but I was so focused on observing myself and the whole time I had a smile on my face. I felt aches and little pains, thought about different things, but it all passed and the relaxation was still there, kind of like background music. It felt like nothing new, but more like something that is always there, waiting to be activated. It was a great experience and I recommend it to everyone!